SAME OLD STUFF, BRAND NEW PODCAST!! Our first treat for today is a new video we produced for IGN entitled "Same Old... Stuff." We hope it advertises a product that future game sequel developers can use and embrace forever. Watch below or watch even more at IGN.com. Our second bit is Podcast 103. Again, sorry this one is late too- We didn't even have any technical errors with this show (we recorded it the same way we used to), we literally just had a problem uploading it last night. That drama is over and you can enjoy it below. We discuss Final Fantasy VII on the PSN, Megan Fox, foreign chips, and much more! Watch below or subscribe to the left. Audio version is here. And on our final note- We are returning to do a panel at Anime Expo! 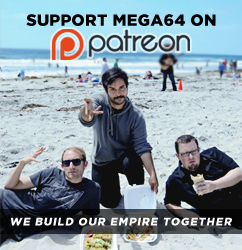 As is so eloquently stated in the banner that is probably to the right of this story right now, we will be doing a panel at the con, entitled "MEGA64: PANEL OF THE COLOSSUS," and it will be on Thursday, July 2nd, at 6PM in Room LP1. That timeslot is immediately after the exhibit hall closes, and we're not up against any super major events, so really... you kinda have no excuse not to be there. We'll be cosplaying and showing secret new videos and other shocking surprises- be there! Be sure to come back here soon- Tickets will soon go on sale for our theater screening premiere event in San Diego! You don't want to miss this, dudes!!!!!!! !